The AutoCAD Insertion Scale is a mystical creature. Get it right, and the results are magical. Get it wrong, and you’re cursed with a riddle of why AutoCAD objects scale to seemingly random sizes when inserted into a drawing. Though it may seem like a curse, the good news is the counter-spell is an easy fix. 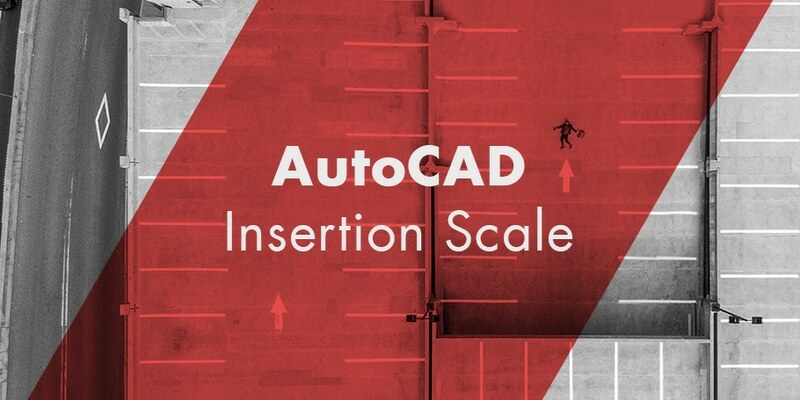 Veteran AutoCAD users likely recall a time when there was no such thing as Insertion Scale. Using AutoCAD 2000, I remember struggling to figure out what scale to insert the first civil drawing I received into the MEP drawing I was working on. At that stage of my career, I had not yet learned civil engineering drawings (in the US) are typically prepared in decimal feet whereby building plans are usually developed in inches. Though each is a form of Imperial measurements, a scale factor of 12 or 1/12th is necessary to exchange drawings inside or outside the building. Unscaled, an object measuring 2 feet, or 24 inches in an architectural or MEP drawing will measure 24 decimal feet in a civil or survey drawing – that’s twelve times the intended size. Conversely, unscaled, an object measuring 2 decimal feet in a civil/survey drawing would measure just 2 inches in an architectural/MEP drawing – one-twelfth the intended size. A scale factor is necessary when these two worlds collide since one unit in architectural drawings equal one-inch, but equals one-foot in civil/survey drawings. Is your head hurting as you try to make sense of when to scale objects by a factor of 12, and when to scale objects by a factor of 1/12th? You’re not alone; this is a concept that’s confused some of the savviest AutoCAD users I’ve known. And that my friend is why we can now set an Insertion Scale in AutoCAD. 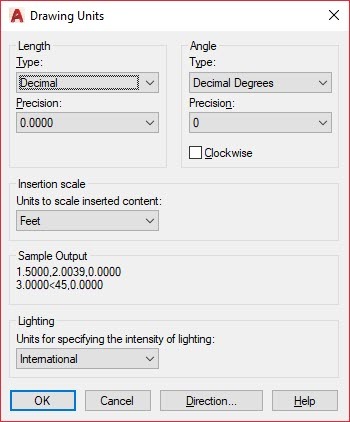 When correctly configured, AutoCAD will automatically figure out the proper scale when going from inches to feet, Imperial to Metric, or just about anything in between. Three variables control how Insertion Units behave, or misbehaves, in your drawing. I’ll break each of these down in a moment, but the rule of thumb is to set Insertion Units to whatever the units are in your drawing. Generally speaking, that means drawings whose Length Type is set to Architectural should have an Insertion Scale of Inches, and civil engineering drawings whose Length Type is set to Decimal should have an Insertion Scale of Feet (or US Survey Feet). From the Drawing Units dialog box, select the Units To Scale Inserted Content drop-down menu within the Insertion Units group. 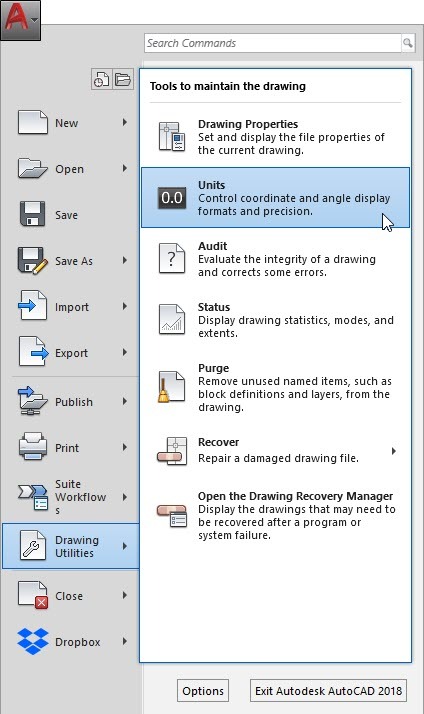 Click OK to set Insertion Units and close the Drawing Units dialog box. Like most configuration-related AutoCAD topics, spending the time to correctly configure your drawing from the start will pay dividends in the long run. Though that may be the case, we don’t always control the drawings we inherit. Thus the question remains, what is the best way to manage such drawings that are not properly configured? The INSUNITS setting is a drawing variable. That means this is a setting that’s stored within your individual drawings. In fact, this is the setting you’re changing when changing the Insertion Scale within the Drawing Units dialog box (discussed above). Though more time consuming, the best practice for managing Insertion Units is to configure this setting for each drawing in your project. Using a tool like ScriptPro is a way to automate the process of updating a large batch of existing drawings. Configuring individual drawings will allow you to insert drawings in any direction necessary. In other words, you could insert an architectural drawing into a civil/survey drawing, or a civil/survey drawing into an architectural drawing. AutoCAD will correctly scale drawings regardless of which is the source and which is the target. Unlike INSUNITS, INSDEFSOURCE is a system variable. Stored inside the Windows registry, AutoCAD uses this variable when INSUNITS for the source drawing is 0, the numeric value for Unitless. This variable sets a systemwide default for Insertion Units for the source drawing. The source drawing is the drawing you’re inserting/referencing into a target drawing. The INSDEFTARGET system variable is the INSDEFSOURCE system variable counterpart. Counter to the INSDEFSOURCE system variable, the INSDEFTARGET system variable applied when INSUNITS within the current (target) drawing is 0, the numeric value for Unitless. This variable sets a systemwide default for Insertion Units of the target drawing. The target drawing is the drawing your inserting a source drawing into. Although the INSDEFSOURCE and the INSDEFTARGET system variables provide a workaround to configuring individual drawings, it’s just that – a workaround. The recommended practice is to set INSUNITS within each drawing to ensure Insertion Units function as designed. While some veteran AutoCAD users may prefer disabling INSUNITS altogether, I would suggest shying away from such a draconian action. Properly configured, INSUNITS is a wonderful AutoCAD function that dramatically simplifies the process of working with varied units. What secrets and insights do you have about AutoCAD Insertion Units? Sound off in the comments section below. I completely agree with you Donnie, scaling can be a real pain at times. But then INSUNIT isn’t as versatile and have limitations. Like dynamic block won’t support INSUNITS directly. You’d need a scale factor for its use in imperial drawings. Secondly, for annotative blocks, they would need manual scaling as in the target drawings. I have an example right now — where two drawings are set to FEET (in INSUNITS). The “Scale objects inserted from other drawings” toggle in C3D is not enabled, yet during the XATTACH command, AutoCAD\C3D changes the scale in the “Attach External Reference” dialog to 0.08333333. Zero reason for a scale factor to be applied, much less applied with no way to change it. That’s just it Adam. I rarely find users who know anything about this feature and/or they did not start with a good template, and/or they are working on someone else’s mess and the end result is usually – a phone call “Why is my XXXX coming in too small/big?”. The fact that “Feet” was International Feet (and no option for US Survey Feet until 2017) was just another curve ball in the mix. The good intention is there, but it should not get in the way of those who do not adopt. I wouldn’t call it guessing…unless your consultant didn’t set the INSUNITS either. Mine are always set to Feet, and most architects are set to Inches. I’ve worked with surveyors who use a mix of unitless and inches (of all things). When XRefing, you can see the insertion units on the dialog box, and you can either scale it yourself at that time or after insertion (if it doesn’t come in right). I find it a huge time saver when it’s setup right…unfortunately, I work with a lot of CAD luddites. I find the Insertion Scale issue isn’t as big of a deal for building trades, as the default setting for Imperial drawings is Inches. I suspect many of those users aren’t impacted positively or negatively in their day-to-day work since the setting is correctly set for them out of the gate. Where I find trouble is with civil and survey drawings. 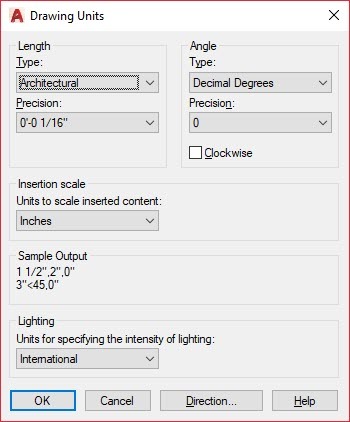 Since the AutoCAD default is Inches, one cannot assume civil/survey drawings are correctly setup. Because of that, I find such drawing sets often have an inconsistent Insertion Scale, and thus inconsistent scaling issues when inserting drawings. Like you, when set correctly, I’ve come to find the Insertion Scale feature to be a benefit to my own workflows, and hate to see people disable it altogether. One of the worse ideas ever dumped into AutoCAD. Set INSUNITS to 0 and I will scale something if it needs to be scaled. Don’t try and guess for me.